It’s around the time of 1941’s Seeing is Believing that things start to change. First, the gloom evaporated. Over time the puzzles became more and more slight. Carr could still bait an alluring hook, but he rarely captured the imagination in the same way as the previous era. Worse still, the once great character of Merrivale was reduced to a slapstick clown who happened to solve the mystery at the end of the story. Don’t get me wrong, you’ll enjoy The Gilded Man, The Curse of the Bronze Lamp, or My Late Wives, but they just don’t operate at the same level as their predecessors. Going into The Skeleton in the Clock, I was prepared for more of what had recently come before it – a solid read with a promising setup that ultimately fails to live up to its potential. While I’m always hoping that one of the dwindling Carr titles that I have left will “be the one”, I’ll admit that I never expected to be swept away. Martin Drake is in love with the fragment of a woman he briefly encountered onboard a chaotic train during WW2. Three years has passed, the war has ended, but Drake still searches, despite only knowing a first name. There’s a bit of an echo of 1947’s The Sleeping Sphinx in that war-torn romance, and in another similarity, the lovers being reunited propels the story into the investigation of a past crime. Twenty years has gone by since the unexplained death of Sir George Fleet. The victim had been standing atop his mansion watching a nearby fox hunt through a pair of binoculars. Although Fleet was alone on the roof, several witness claimed that he was pushed by an invisible hand, causing him fall to the flagstone far below. The death was ruled an accident, but since this is a Carr novel, we can safely assume we’re dealing with an impossible defenestration. That’s good in my book. A similar impossibility presented in Paul Halter’s The Demon of Dartmoor features one of my favorite solutions. A series of postcards sent in the present day era suggests that Fleet’s death should be reinvestigated, drawing attention to two key clues – “the skeleton in the clock” and a “pink flash” that was seen on the roof at the time of the fall. “The skeleton in the clock” is a reference to, well, a skeleton in a grandfather clock that Sir Henry Merrivale picks up at an action while with Martin Drake. How this bizarre artifact is tied to the murder two decades ago is another thread of mystery. The real treasure of the plot though involves a chilling night spent in the death house of an abandoned prison. There’s a bit of a debate between characters early in the novel about whether violent spirits are forever chained to the location where they met their demise. This leads to a bet in which two men spend the night in a location where earth bound souls are most likely to dwell. One man is locked in the room where condemned prisoners lived out their final days, while another is locked in the actual chamber where the hangings took place. The resulting chapters will have you checking over your shoulder if you read this at night. It’s as if Carr woke up one morning and thought “you know, The Plague Court Murders wasn’t creepy enough.” A murder does occur during the ordeal, but who the victim is and the details of the crime are best left for your own discovery. In fact, the mystery of finding out exactly what happened that night is absolutely mouth watering. Package this all together and The Skeleton in the Clock is a riveting read. Although the 1948 version of John Dickson Carr has shed the naive punk bravado that has propelled many an artist’s early efforts, this is a writer mid-flight through some of his best story telling years. We’re four years removed from Till Death Do Us Part and two from He Who Whispers – commonly held to be some of Carr’s better overall plots. Fast forward two years and we’re at the start of Carr’s historical arc, with the writer in full story telling glory. That last bit is interesting, as The Skeleton in the Clock shows the first sketches of Carr’s historical mysteries to come. This is the first book that I can think of where he starts to add in bits of historical trivia. There’s a nice passage on banned fencing tricks, a reference to Thackery’s Esmund (a novel returned to later in Scandal at High Chimneys), and a trickle of other minutiae. We’re not quite into action territory yet – that would emerge a year later with 1949’s Below Suspicion. Between those two novels though there’s a glimmer of what would come in later work such as Fire, Burn and Fear is the Same. There are some backward references as well in The Skeleton in the Clock – The Curse of the Bronze Lamp and The House in Goblin Wood get a mention, although nothing spoiler related. There’s also a nod to the Dr Fell short story The Wrong Problem, which could be viewed as an additional hint that Merrivale and Fell inhabited the same universe. Now, I’ve kind of built up The Skeleton in the Clock a bit, and for good reason. However, it is not all so rosy. This is a book that comes up a bit short in the end. Well, the end of the book is actually extremely exciting, but the solutions to the puzzles don’t really live up to their potential. Once you have all of the information, it doesn’t really make sense why certain things were done, or why there was really a puzzle in the first place. I’ll dig into this a bit further in a spoiler section below. The Skeleton in the Clock was similar to The Red Widow Murders for me – a flat out awesome book that built up such an epic mystery but ultimately didn’t deliver the solution I wanted. Granted, I have different standards for Carr. 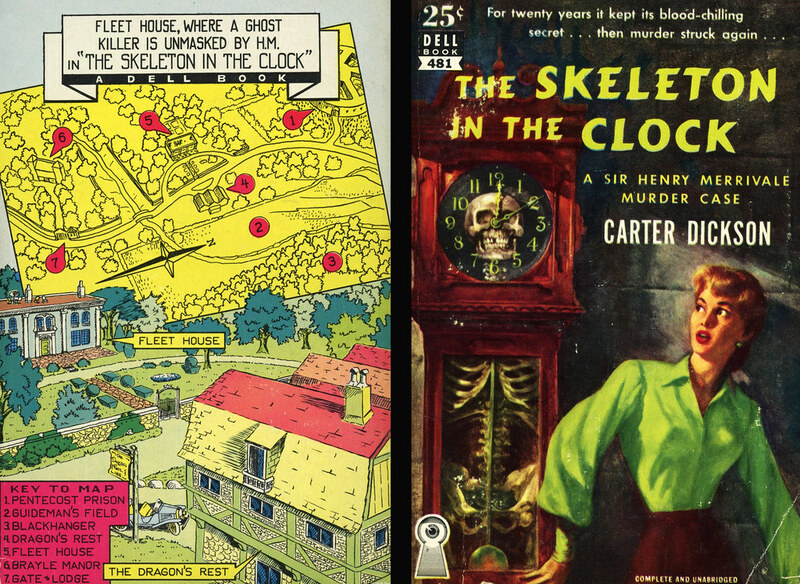 The solution to The Red Widow Murders or The Skeleton in the Clock would be perfectly fine in most any other author’s library, but with Carr I think we’re looking for that especially satisfying solution. In the end, I absolutely recommend this book. The prison sequence may well be Carr’s creepiest scene, the impossible defenestration is presented as a classic puzzle, and the story in general captures the writer at his best. I can only hope that one of the remaining books in my To Be Read pile will be this good. I haven’t seen that many great editions of The Skeleton in the Clock. There’s an IPL edition with an interesting cover, although I’ve never seen it for sale. There’s a Dell map back with a nice illustration that captures some key layout of the setting where the story takes place. I wish I had held out for that one. I, however, have two dud editions. First we’ll take a look at my 1977 Belmont Towers edition with the darker blue cover, shown up top. Uh, who is that dapper gentleman in the suite smoking the cigarette? It certainly isn’t Merrivale – he’s bald. There is no character in the book that matches this description… or so I thought, until it dawned on me that it could be Chief Inspector Masters. Anyway, I got a good loud laugh out of that when it came to mind. Next we have my 1973 edition, once again by Belmont Towers. This one is just weird. There is this guy on the cover with a beard and a gun who certainly isn’t in the story. It seems that Belmont Towers used this same illustration of the man on several other Carter Dickson books, so I suppose they decided that is what either Merrivale or Masters looks like. Or, more likely, they just threw some random image on the cover. Speaking of random images: you might have to click on the cover I’ve posted to view it at full size, but there is a portrait on the wall (kind of hard to make out) of Adolph Hitler. Now, when I noticed this detail midway through reading the book, I couldn’t help but let out a groan, thinking that the plot was going to devolve into some neo-nazi conspiracy tripe. Fortunately nothing like that ever happens, and I can only assume that Belmont Towers selected random art for their book covers. Oh yeah – the inner page includes one of those snippets of the story where the publisher tries to entice you to read the book. Unfortunately, the section that they chose is probably one of the most exciting surprises in the story. Fortunately I’ve learned to skip over content like that until after I’ve read the book. I encourage you to do the same. And now to spoilers. I’m not going to give away the solution, and I intend to speak in somewhat general terms, but I will be making some comments that would probably ruin your reading experience if you haven’t read The Skeleton in the Clock yet. If you chose to comment on any of these elements below, please be tactful and sensitive to others who haven’t read the book. The whole bit about the actual skeleton in the clock really doesn’t make any sense in the end. Like, they wanted to avoid drawing attention to a clue in case the body was exhumed, so they decided take a course of action that is… 100 times more noticeable?!?!? The solution to the impossibility on the roof was a total let down. Once you factor in all of the lies and holding back of evidence, the solution to the cause of the fall could have been nearly anything. There are several solutions that were ruled out early in the book that actually could have been valid. The second crime (the murder in the prison) was never really played up to its full potential. It seemed to be immediately dismissed as a manipulation of time tables, and then Master just casually… kind of… provides the solution. By the end when it was fully explained it just wasn’t really that interesting. I confess – and you will understand this, Ben – that I gave this the most cursory of skims! What I got was the wonderful news that this should be a highpoint in my celebration of Carter Dickson. It, too, has been on my TBR pile for a couple of years but has remained inactive. It will be a while before I get to it – that bothersome issue of chronology, don’t ya know – but I’m glad to hear that it has much to recommend it. I look forward to that dim future time when we can discuss it together! It will be a while before you get here, but I’m really looking forward to all of the Carter Dickson books that you review in between. I’m delighted you enjoyed Skeleton so much! I have long maintained that this and A Graveyard to Let, though both have their flaws, stand far above H.M.’s three final cases in quality. I love the concept that if ghosts are bound to the place they died, and if vicious people make vicious ghosts, then the execution shed of a prison would be the most dangerously haunted place imaginable. I do wonder what the story is behind that bearded guy Belmont Tower put on the covers of several H.M. novels (in addition to Skeleton and White Priory, he’s also on their editions of Graveyard and Death in Five Boxes.) Maybe they figured putting a man who looked like Winston Churchill on the cover wouldn’t be hip enough for the times. It always bothered me that the Belmont blurb writer always referred to the character as “Sir Henry” or “Merrivale” – it’s “H.M.”, dammit! I found the slapstick bit at the auction to be one of those atypical ones in the H.M. saga that was actually funny. It also went on for just a few paragraphs, which probably helped. The final chapter is one of the most vivid cases of a Carr character becoming more interesting once we find out they’re the murderer – and what was really going on with them as we were reading the story. I did not foresee that this person would turn out to be the guilty one, and after finishing I reread the book to see the character’s scenes in their true light. I didn’t get into the slapstick aspects in my review, but I agree this one is tolerable. This is definitely one of the better ones as far as humor goes for a post-Gilded Man Merrivale novel. Thank you Ben! Another unappreciated Carr that turns out to be brilliant! I’m so happy to know this is a good one and that won’t cease to surprise us. I have a very nice copy of this too. What edition do you have? I think its the Red Pan copy. Thanks for this review. 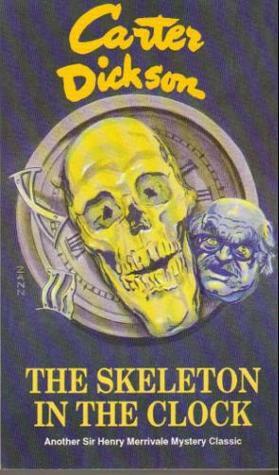 I remember liking Skeleton in the Clock when I read it during my teen years, and I was planning to read it again soon. I’m glad to hear that revisiting this old haunt (pun intended, I guess) is likely not to disappoint. The reading copy that I have is that Belmont Tower edition. 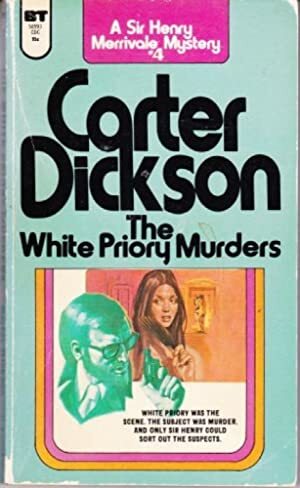 It has a ghastly cover, but I’m just thankful that back in the 1970s there was a publisher that saw fit to keep the book in print. It’s not a classic in the sense that it doesn’t deliver on the solution in the sense that others do, but it nails it in terms of being an enjoyable read from cover to cover.